The SPA400 features the ability to connect up to four (4) standard analog telephones lines to a Linksys Voice System (LVS) VoIP network and includes the additional benefit of an integrated voicemail application. The SPA400 utilizes multiple analog phone lines and automatically routes calls to and from your existing PSTN telephone service. Designed to be implemented with the LVS IP Telephony System, the SPA400 enables cost-conscience business users to leverage the high value features generally found only on more expensive PBX equipment. 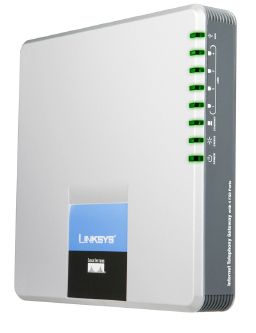 The SPA400 also includes an integrated voicemail application server supporting up to 32 voicemail accounts or boxes with customized greetings, providing LVS users the ability to receive and playback voicemail messages from their Linksys IP Phones.